The robots are coming, and we fleshy mortals are certainly no match for these new men of steel. On a more cheering note, they're not yet fully sentient, so are still duped into doing menial tasks around the home. Such is the lot of the AirCraft PILOT MAX Robot Vacuum Cleaner, the latest in a string of home drones aimed at solving the hoovering crisis – you know the one we mean. In appearance the AirCraft MAX is similar to most other cleaner bots on the market, being a white disc just over a foot round and a mere 90mm deep. Build quality is decent, and although entirely plastic it's not as budget as some, with a decent heft and a perspex-esque layer on the top. A series of lights a la Knight Rider run across the top front, together with an IR sensor. Along the front edge run a row of rectangular proximity sensors, giving a design flavour of Millennium Falcon to the proceedings. Underneath there's a central roller brush, and a spidery-side brush to get into corners. A charger/dock with an IR eye, a remote and a small barrier tower complete the ensemble. 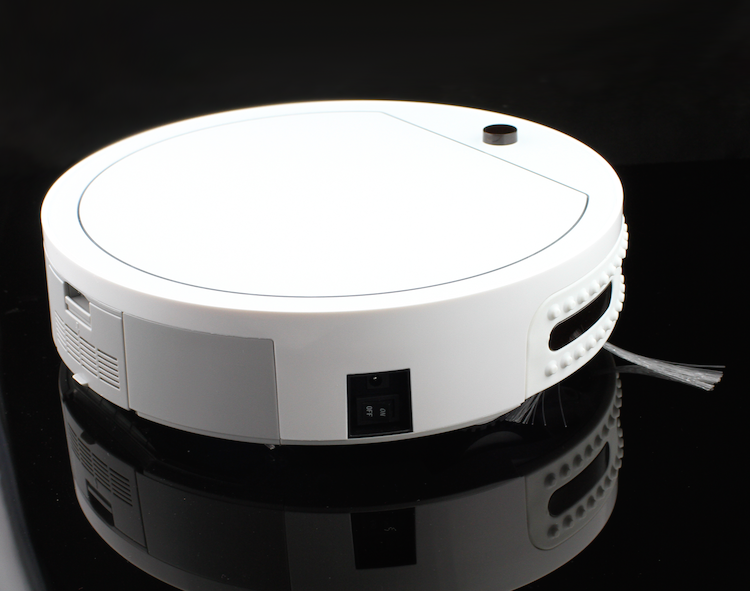 Once it's charged and paired with the dock, you've got three options for getting the cleaning done – auto, which fires the bot round the room randomly until the battery is almost dead, spot, where the bot dithers around the same small area until the carpet or battery wears out, and programmed. This third option lets you select which days of the week your robo-help will slurp up the dustmites (one thru seven, or all) like an overly active heating control. According to the blurb, the AirCraft PILOT MAX can clean all floor types, including carpet, tiles, hardwood and linoleum, and in our tests this was borne out. Surprisingly, the collision sensors work most of the time, saving the paintwork and delicate furniture from being terminated, and the stair avoidance tech also saves the AirCraft PILOT MAX from an untimely tumble down the landing stairs. Testing in an upstairs bedroom revealed an immediate win, as the plucky bot disappeared underneath the bed, hoovering lustily. However, as the instructions do indeed warn, 'floor preparation' is required, as clothing, phone charger cables and similar are enthusiastically sucked into the digital maw – a process that results in a plaintive beeping from the immobilised little drone. On the upside, the bot works out itself when battery power is running down, and uses the IR beacon on the charger dock to locate it, all automatically. The instructions clearly request the charger beacon be located somewhere where there is 1m clearance either side, and a whopping 3m in front, which rules out 99% of London housing. Still, our test bot refused to be put off by our lack of space, and found the dock with ease (except the time it became tangled in a chair, but we'll gloss over that). The barrier tower works too, blocking off areas you'd rather not have cleaned, like your precious sawdust collection. Obviously there are physical limitations to cleaner bots, and you still need to empty the relatively tiny dust carrier, but overall they're becoming increasingly useful. If you've got a lot of stairs, or very complex room shapes with narrow passageways then a cleaner bot isn't for you, but larger open spaces are cleaned pretty effectively. It won't replace a human cleaner for a long while yet, but it does keep the dust down with the minimum fuss, and that's certainly worth having.